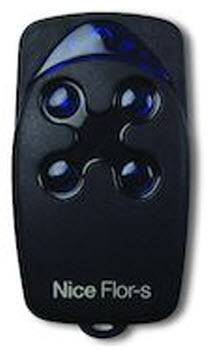 NICE remote controls can be synchronised either remotely or directly on the receiver. In addition to the rolling code versions, the BIO version and the regenerative reception versions of the VERY and FLO models must be synchronised in these devices. 1. Stand near the receiver and press and hold the button on the device you wish to synchronise for at least 5 seconds and then release. The LED on the receiver will flash and then remain steady. 2. Slowly press the first button on the already synchronised remote control 3 times and then once more on the new device. The new remote control is now synchronised. Wait 15 seconds before testing. 1. Open the receiver and press the button on the circuit board for around 3 seconds until the LED light up. 2. Within the next 10 seconds, press the button on the remote control to be synchronised for 2 seconds. Attention: the position of the 10 receiver switches must be known to synchronise this device. 1. Press the 2 buttons on the remote control to be synchronised simultaneously. The LED will light up steady. 2. The 10 codes must be entered within a period of 5 seconds. To do so, take the following steps. 3. Press the first button (top) if the switch is set to ON and the second if it is set to OFF. Press 10 times for the 10 codes. Master BIO and VERY RESONADOR remote controls must be synchronised directly, but this is not necessary for copies of an already synchronised device. ESTAS INSTRUÇÕES PODEM NÃO SER INDICADAS NO CASO DO INSTALADOR TER MODIFICADO A PLACA ORIGINAL. NO CASO DA PLACA ORIGINAL TER SIDO ALTERADA É NECESSÁRIO A PROGRAMAÇÃO DE RAIZ A PARTIR DO BOTÃO DO AUTOMATISMO.